Yesterday I finished Dave Itzkoff’s book Robin about Robin Williams. I sobbed through the last 70 pages and still feel pretty heartbroken about it. Right after I finished the book I got dinner with my friend Haven, who informed me that the most recent episode of This Is Us is the saddest one yet..I have been avoiding/dreading that sadness. And then I came home and finished season 1 of The West Wing where everyone got shot….so I’m going to write about something happy to get my mind off of my sadness (2/3 of my sadness is fictional, but my brain doesn’t get that). Anyways, here are my favorite TV dogs! Happy is the best. 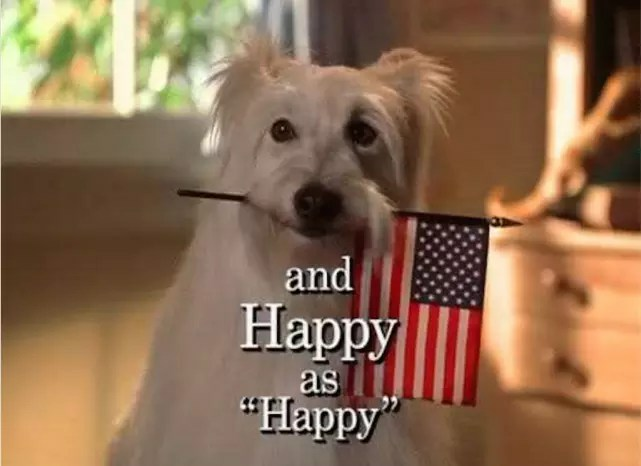 Nothing makes me happier than when something dramatic happens and the camera zooms in on everyone’s reactions, because they also zoom in on Happy’s face, which is never not hilarious. I also love looking at Happy’s IMDb profile as it talks about her auditioning for 7th Heaven and how this was her first Hollywood role. Eddie looks at Kelsey Grammer the same way that I look at Kelsey Grammer, so I can relate. However, I would like to think that Kelsey Grammer would like me more than Frasier liked Eddie. Also fun fact, Moose, the dog who played Eddie, received more fan mail while on Frasier than any human on the show. Besides how stinkin’ cute this dog is, he also played Buddy on Air Bud. What a talented pup. He was a guest on the Late Show with David Letterman in 1994 and even got to go to the Kid’s Choice Awards on Nickelodeon TWICE in 1995 and 1998. This dog lived my dream. While coming up with my list I learned that Bruce Willis was the voice of Spike, and that was a very fun fact for me. Paul Anka (the dog, not the singer) is just a bigger version of my dog Aurora. He is an odd dog, but I would also probably be pretty odd if I lived with Lorelai Gilmore. He is scared of peas, tissue-holders, lint, paperbacks, CD’s, framed pictures and popcorn. He doesn’t like when people watch him eat, or when anyone approaches him while wearing a watch. But he shows up when we need him, and we love him. Champion is the dog world champion. His parents are April and Andy, and he learned German from Chris Traeger (more dreams lived out by a dog). 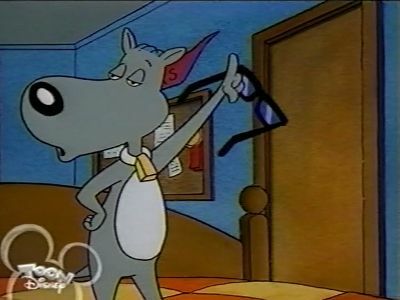 Porkchop has a bigger personality than Doug, which is fun because the show is called Doug, not Porkchop. He loves music, pizza, but most of all, he loves Doug. Ivana’s full name is Ivana Priscilla Veronica Tipton-Fitzpatrick. Ivana is the counterpart of Tinker Bell (Paris Hilton’s dog.) However, Ivana is aware of London’s lack of intelligence, which is the best. Ivana has puppies with Maddie’s dog at the end of the show, and their names are Scruffy (named by Maddie), Prince Percival Persimmon Du Loc (named by London), and Maria Consuela Margarita Fransesca DeCielo (named by Estevan). First of all, Kitty is my favorite character on That 70’s Show, so Kitty and Schatzi brings me so much happiness. Schatzi is German for “little treasure” which I feel is pretty accurate. 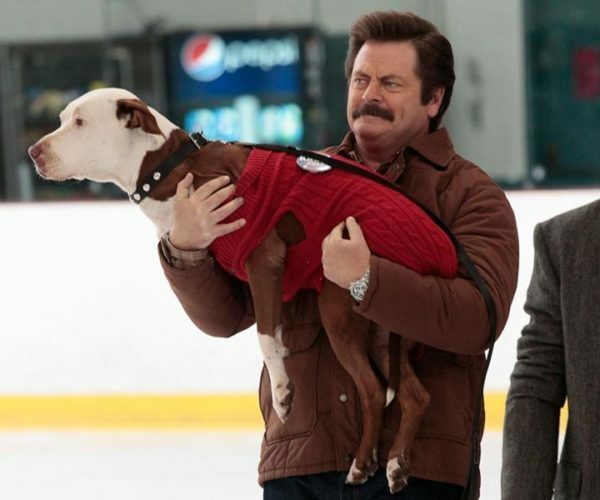 Who are your favorite TV dogs?? ?